The Old Nashville / The Engine that Drew Lincoln's Funeral Train from Washington, D.C. to Springfield, ILL.
View of steam locomotive "Old Nashville" at the Willson Street Station in Cleveland, Ohio, April 28, 1865. This was just one of many locomotives used by various railroad to pull the Lincoln funeral train. This locomotive was owned by the Cleveland, Columbus, and Cincinnati Railroad and pulled the funeral train from Cleveland to Columbus. 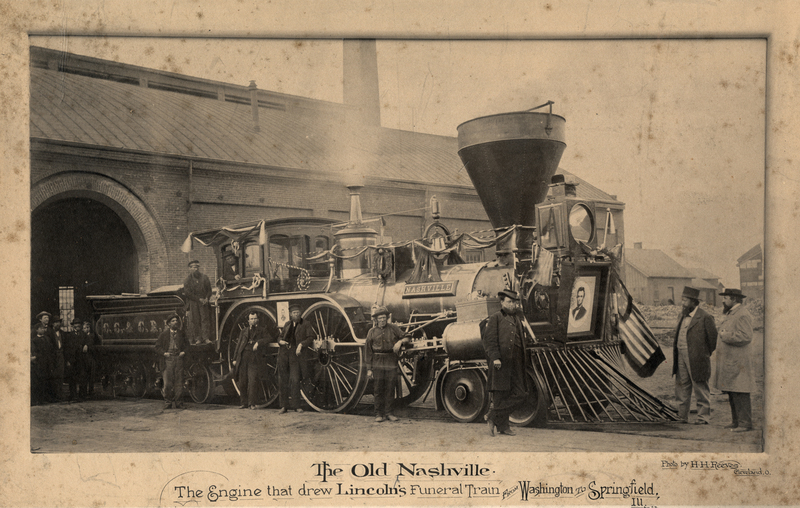 This photograph is the best image of any of the various funeral train locomotives and so all models of the "official" Lincoln funeral train rely on this engine. H.H. Reeves of Cleveland, O.